Glen Ervin Freeman Sr., of Lawrence, Kansas went to be with the Lord January 25th, 2011. The family will receive friends from 5:00 to 7:00 p.m. Thursday at Warren-McElwain Mortuary in Lawrence. Private military graveside services are planned at a later date. Mr. Freeman was born to Orval and Mary Francis House Freeman on Dec. 23rd, 1921 in Kansas City, Missouri. After his mother tragically died when he was 5 years old he moved to the Lone Star, Kansas area and was raised by his foster parents, Elza and Cecil Bond. 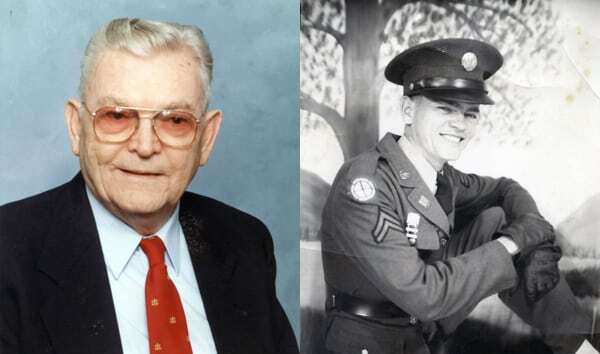 Mr. Freeman joined the U.S. Army after graduating from Liberty Memorial High School in Lawrence. On June 14th, 1941 he married his sweetheart Marian Ramona Votaw in Little Rock, Arkansas. A few months after his marriage, he was deployed to the South Pacific in WWII proudly serving his country going to Guadalcanal, New Caledonia, Fiji, Efate and many other islands. He was extremely proud of his service to the United States and was a founding member of the Americal Division (Americans in New Caledonia). After returning to the United States in 1945 he became a mechanic at Ship Winter Chevrolet from 1949 until he started his own business, D&G Automotive Service from 1960-1969. Glen and his wife Marian shared 55 very happy years of marriage until Marian passed away in 1996. Mr. Freeman was preceded in death by his wife, parents, his foster parents and his older brother Melvin. Survivors include three sons: Glen Freeman Jr., and wife Vivian of Lawrence, James Freeman and wife Janice of Sumter, So. Carolina, Richard Freeman of Lawrence and Daughter Mary Ann Willems and husband Hank of Lawrence. Mr. Freeman is also survived by seven Grandsons, one Granddaughter, five Great Grandsons, three Great Granddaughters, and a Great-Great Grandson. He will also be greatly missed by a younger Brother Basil Freeman and wife Bernice of Shawnee, Kansas and a younger Sister Ida Belle Pahler of Country Club Hills, Illinois. In lieu of flowers the family requests donations to The Lawrence Humane Society sent in care of Warren-McElwain Funeral Home.